What should come first in international politics: values or interests? For the West, this dilemma has been thrown into sharp relief by the murder  of the self-exiled Saudi journalist Jamal Khashoggi at the hands of a Saudi death squad in Turkey. 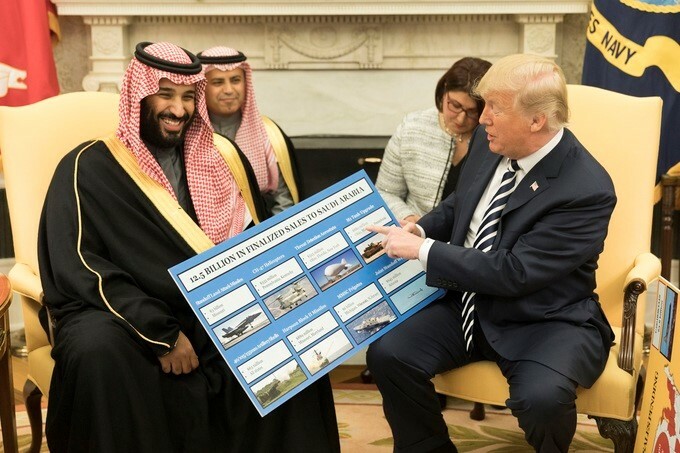 Saudi Arabia, after all, is a major purchaser of Western arms, a leading oil producer, and a crucial asset for confronting and containing Iran. Moreover, the Kingdom is a key player in an ongoing power struggle in the Islamic world. And, until Khashoggi’s murder, it had appeared to be on a path towards serious reform. In 1979, the Islamic Revolution that triumphed in Iran failed in Saudi Arabia. For two weeks in November and December of that year, a group of armed zealots seized the Grand Mosque in Mecca (Islam’s holiest site) and called for the overthrow of the Saudi government. Ultimately, they were overpowered by the Saudi military. But the episode left the Saudi leadership far more inclined to compromise with, and even directly assist, Islamist radicals and extremists. Then came June 2017, when Mohammed bin Salman (MbS) was suddenly named crown prince and heir apparent to the Saudi throne. To many observers, Saudi Arabia finally seemed to have a leader who would confront the entrenched interests that had long prevented the country from modernising. Western countries, and particularly the United States, had been waiting for decades to see such a shift in the Kingdom’s politics. At first, it was hard for Western leaders not to be seduced by MbS and his ambitious reform agenda. Finally, there was someone to lead the Sunni world in its hegemonic struggle with Iran. Egypt had effectively opted out of the regional-influence game, and Turkey, though a member of NATO, was a difficult partner. For an American president bent on breaking from his predecessor’s more balanced approach to the region, MbS was a godsend. But MbS soon showed himself to be far from perfect. He took unnecessary risks by escalating his war in Yemen, and now has a significant amount of civilian blood on his hands. He kidnapped  the prime minister of Lebanon, Saad Hariri, and detained a host of wealthy Saudis in the Ritz-Carlton in Riyadh, releasing them from their forced retreat only after they had parted ways with much of their wealth. The message of the Khashoggi murder is no less clear: dissidents and opposition figures should know what awaits them if they continue to criticise the new regime. Dreaming of democracy in the Arab world is fine, so long as one understands that reform will come only from the top. Whether MbS’s behavior is driven by impulsiveness, immaturity, his close relationship with America’s first family—particularly President Donald Trump’s son-in-law, Jared Kushner—or all of the above, there can be no doubt that he has gone too far. One cannot assassinate a Washington Post columnist and expect nobody to mind. And the fact that the crime was committed within the territory of a rival like Turkey only compounds the folly. After the attacks of 11 September 2001, the world is in no way ready to tolerate 15-member  Saudi death squads carrying out operations abroad. Moreover, the sheer barbarity of the murder was not just shocking, but also shockingly naive. It should have been obvious that the Saudi consulate in Istanbul would be wired with surveillance devices. As we now know, Turkish intelligence was able to follow the gruesome act ‘live’, and then disclose it gradually to the rest of the world. The irony of Turkish President Recep Tayyip Erdoğan singling out his young Saudi rival has been lost on no one: journalists may be jailed by the hundreds in Turkey, but at least they are not dismembered! Until now, MbS has considered himself above the law. In addition to enjoying the tacit protection of the Trump court, he knows that the world is still heavily dependent on Saudi oil. As Canada recently learned, MbS’s regime will not hesitate to play the oil card in response to criticism about its record on human rights. But MbS was wrong to assume that he would never be challenged on that issue. The business imperative of maintaining good ties with the Kingdom still stands. Yet the tables have turned: Saudi Arabia is now more dependent on the US than vice versa. The growth of US shale oil means that America can withstand a cut in Saudi supplies. The Saudis, on the other hand, cannot function militarily without US arms. The balance of power between the two countries has shifted decidedly in the US’s favor. As the Khashoggi spectacle has unfolded, the two biggest political losers have been MbS and Trump. For his part, MbS will now have to fight off mounting opposition within the royal family. Even if business as usual continues, his domestic opponents can now make the case that, far from modernising his country, he is leaving it isolated and weaker than it was before he came to power. Trump, meanwhile, must now clean up the political mess that he and his family have created for themselves by forging warm personal ties with foreign despots. To be sure, MbS has nothing to do with North Korean leader Kim Jong-un. But there is a pattern emerging, and no one will be surprised when Trump’s relationship with Kim blows up in his face, too. Diplomacy is an art. It requires perspicacity, prudence and, above all, experience. Trump has pursued diplomatic outcomes with a kind of sublime carelessness. In MbS, he may have met his match. Dominique Moisi is senior counselor at the Institut Montaigne in Paris. He is the author of La géopolitique des séries ou le triomphe de la peur. This article is presented in partnership with Project Syndicate © 2018. Image courtesy of the White House.